by Bill Dwight on Thursday, April 07, 2011 at 12:23 PM | LEAVE A COMMENT! We’re constantly scouring the Internet looking for articles related to family finances and teaching kids good personal finance habits. You can visit the FamZoo delicious page to see our ever growing list of family finance bookmarks. We’re up to 1280 now! Each week, we pick our favorite articles from the previous week and post them here. 63% of today’s kids get extra money from their parents every time they ask for it? Really? “Extra” means money beyond an agreed upon allowance. Hard to believe. 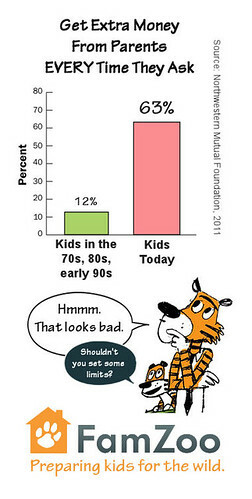 According to an unscientific poll by Themint.org, that’s up five-fold from an alleged 12% for kids growing up during the 70s, 80s and early 90s. I say “alleged” because the figures for the older generations were collected from grown-ups recalling how things used to be. I suspect those recollections are a bit tainted by the old “When I was a kid, I walked 10 miles to school in the snow with no shoes on” effect. What do you think? Could kids these days really be that much more entitled? More importantly, could parents these days really be that much more remiss about setting limits? I hope not. See more on the story and lots of comments here. Parents really need to take the time to set limits and help kids track spending against a budget. A parent should be the hard nosed family banker, not just a free flowing ATM machine. “You make sure your kids change their underwear, right?” asks Trent in his recent post. Hmmm, I haven’t followed up on that recently. Anyway, assuming you do, Trent asserts that you need to be just as vigilant in teaching your kids about personal finance. Why? Well, for one reason, they aren’t learning basic personal finance skills in school. Even if your kids are getting some personal finance instruction in school, it probably isn’t sticking. Trent tells us why, and he offers practical advice for how to make the instruction in schools more effective. It really gets down to real life experiences. Kids need to hear real, relevant stories from others, and they need practice applying the skills themselves in real, everyday situations. See Trent’s thoughtful commentary here. Teacher Victoria Stolinski seems to have anticipated Trent’s advice above. Her highschool personal finance course features engaging guest speakers like Bruce Kajiwara who share real experiences and keep things relevant to the highschool audience (sample exercise: estimate what the senior prom will cost you). Kudos to people like Victoria and Bruce who bring their passion to a critical — but let’s be honest, frequently dull — topic. By doing it right, they’re changing lives. Here’s what 17 year old Tam Nguyen (who works as a dishwasher in a local restaurant) said: "No one ever talked to me about budgeting or saving until I got in this class. This semester has really changed my thinking." Outstanding. Mission accomplished.